These highlights do not include all the information needed to use alfuzosin hydrochloride safely and effectively. See full prescribing information for alfuzosin hydrochloride extended-release tablets. To report SUSPECTED ADVERSE REACTIONS, contact CARACO Pharmaceutical Laboratories Ltd. at 1-800-818-4555 or FDA at 1-800-FDA-1088 or www.fda.gov/medwatch. Alfuzosin hydrochloride extended-release tablets are indicated for the treatment of signs and symptoms of benign prostatic hyperplasia. Alfuzosin hydrochloride extended-release tablets are not indicated for the treatment of hypertension. Alfuzosin hydrochloride extended-release tablets are not indicated for use in the pediatric population. Alfuzosin hydrochloride extended-release tablets 10 mg are available as white to off-white, round shaped, biconvex, uncoated tablet debossed with ‘956’ on one side and plain on other side. in patients with moderate or severe hepatic impairment (Childs-Pugh categories B and C), since alfuzosin blood levels are increased in these patients. [see Use in Specific Populations (8.7) and Clinical Pharmacology (12.3)]. with potent CYP3A4 inhibitors such as ketoconazole, itraconazole, and ritonavir, since alfuzosin blood levels are increased. [see Drug Interactions (7.1) and Clinical Pharmacology (12.3)]. in patients with known hypersensitivity, such as urticaria and angioedema, to alfuzosin hydrochloride or any component of alfuzosin hydrochloride extended-release tablets [see Adverse Reactions (6.2)]. Potent CYP3A4 Inhibitors: Alfuzosin hydrochloride is contraindicated for use with potent CYP3A4 inhibitors (e.g. ketoconazole, itraconazole, ritonavir) since alfuzosin blood levels are increased [see Contraindications (4), Drug Interactions (7.1) and Clinical Pharmacology (12.3)]. Other alpha adrenergic antagonists: Alfuzosin hydrochloride is an alpha adrenergic antagonist and should not be used in combination with other alpha adrenergic antagonist [see Drug Interactions (7.2)]. Phosphodiesterase-5 (PDE5) Inhibitors: PDE5-inhibitors are also vasodilators. Caution is advised for concomitant use of PDE5-inhibitors and alfuzosin hydrochloride, as this combination can potentially cause symptomatic hypotension [see Drug Interactions (7.4)]. IFIS has been observed during cataract surgery in some patients on or previously treated with alpha adrenergic antagonists. This variant of small pupil syndrome is characterized by the combination of a flaccid iris that billows in response to intraoperative irrigation currents, progressive intraoperative miosis despite preoperative dilation with standard mydriatic drugs, and potential prolapse of the iris toward the phacoemulsification incisions. The patient’s ophthalmologist should be prepared for possible modifications to their surgical technique, such as the utilization of iris hooks, iris dilator rings, or viscoelastic substances. The incidence of adverse reactions has been ascertained from 3 placebo-controlled clinical trials involving 1,608 men where daily doses of 10 mg and 15 mg alfuzosin were evaluated. In these 3 trials, 473 men received alfuzosin hydrochloride extended-release tablets 10 mg. 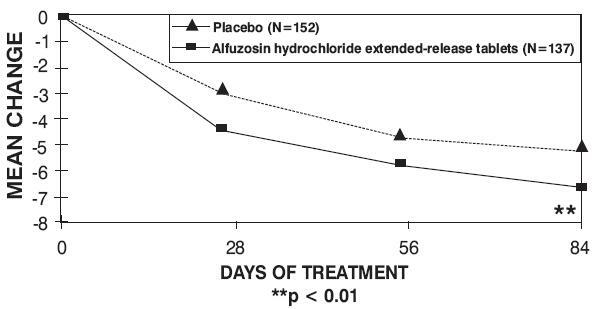 In these trials, 4% of patients taking alfuzosin hydrochloride extended-release tablets 10 mg withdrew from the trial due to adverse reactions, compared with 3% in the placebo group. Table 1 summarizes adverse reactions that occurred in ≥2% of patients receiving alfuzosin hydrochloride extended-release tablets, and at a higher incidence than that of the placebo group. In general, the adverse reactions seen in long-term use were similar in type and frequency to the events described below for the 3-month trials. Testing for blood pressure changes or orthostatic hypotension was conducted in three controlled studies. Decreased systolic blood pressure (≤ 90 mm Hg, with a decrease ≥ 20 mm Hg from baseline) was observed in none of the 674 placebo patients and 1 (0.2%) of the 469 alfuzosin hydrochloride extended-release tablet patients. 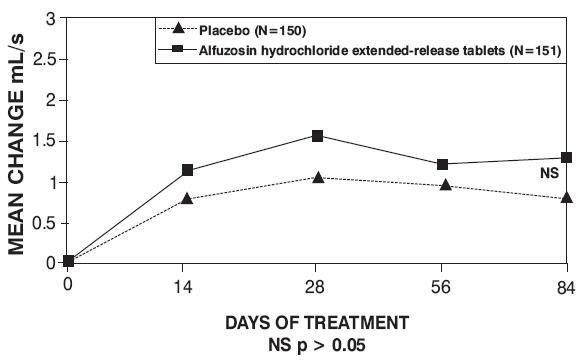 Decreased diastolic blood pressure (≤ 50 mm Hg, with a decrease ≥ 15 mm Hg from baseline) was observed in 3 (0.4%) of the placebo patients and in 4 (0.9%) of the alfuzosin hydrochloride extended-release tablet patients. A positive orthostatic test (decrease in systolic blood pressure of ≥ 20 mm Hg upon standing from the supine position) was seen in 52 (7.7%) of placebo patients and in 31 (6.6%) of the alfuzosin hydrochloride extended-release tablet patients. Alfuzosin hydrochloride extended-release tablets are contraindicated for use with potent CYP3A4 inhibitors such as ketoconazole, itraconazole, or ritonavir, since alfuzosin blood levels are increased. [see Contraindications (4), Warnings and Precautions (5.4) and Clinical Pharmacology (12.3)]. Caution is advised when alpha adrenergic antagonists, including alfuzosin hydrochloride extended-release tablets, are coadministered with PDE5 inhibitors. Alpha adrenergic antagonists and PDE5 inhibitors are both vasodilators that can lower blood pressure. Concomitant use of these two drug classes can potentially cause symptomatic hypotension [see Warnings and Precautions (5.4)]. Additional information regarding a clinical study in which efficacy was not demonstrated in pediatric patients ages 2 to 16 years is approved for Sanofi-Aventis U.S. LLC’s alfuzosin hydrochloride extended-release tablets. However, due to Sanofi-Aventis U.S. LLC’s marketing exclusivity rights, this drug is not labeled with that pediatric information. Each alfuzosin hydrochloride extended-release tablet contains 10 mg alfuzosin hydrochloride, USP as the active ingredient. Alfuzosin hydrochloride is a white to off-white crystalline powder that melts at approximately 240°C. It is freely soluble in water, sparingly soluble in alcohol, and practically insoluble in dichloromethane. Alfuzosin hydrochloride is (R,S)-N-[3-[(4-amino-6,7-dimethoxy-2-quinazolinyl) methylamino] propyl] tetrahydro-2-furancarboxamide hydrochloride. The molecular formula of alfuzosin hydrochloride is C19H27N5O4•HCl. The molecular weight of alfuzosin hydrochloride is 425.9. The tablet also contains the following inactive ingredients: pregelatinized starch, hypromellose, hydroxypropyl cellulose, basic butylated methacrylate copolymer, colloidal silicon dioxide, magnesium stearate, and talc. The effect of 10 mg and 40 mg alfuzosin on QT interval was evaluated in a double-blind, randomized, placebo and active-controlled (moxifloxacin 400 mg), 4-way crossover single dose study in 45 healthy white male subjects aged 19 to 45 years. The QT interval was measured at the time of peak alfuzosin plasma concentrations. The 40 mg dose of alfuzosin was chosen because this dose achieves higher blood levels than those achieved with the coadministration of alfuzosin hydrochloride extended-release tablets and ketoconazole 400 mg. Table 3 summarizes the effect on uncorrected QT and mean corrected QT interval (QTc) with different methods of correction (Fridericia, population-specific and subject-specific correction methods) at the time of peak alfuzosin plasma concentrations. No single one of these correction methodologies is known to be more valid. The mean change of heart rate associated with a 10 mg dose of alfuzosin in this study was 5.2 beats/minute and 5.8 beats/minute with 40 mg alfuzosin. The change in heart rate with moxifloxacin was 2.8 beats/minute. The QT effect appeared greater for 40 mg compared to 10 mg alfuzosin. 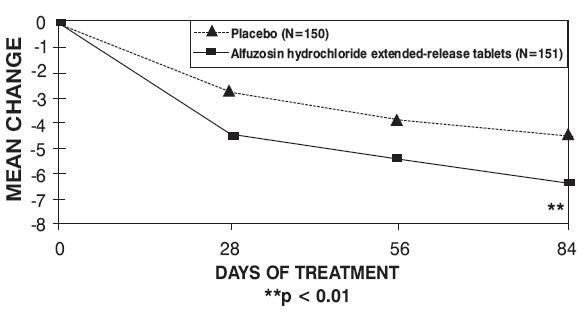 The effect of the highest alfuzosin dose (four times the therapeutic dose) studied did not appear as large as that of the active control moxifloxacin at its therapeutic dose. This study, however, was not designed to make direct statistical comparisons between the drugs or the dose levels. There has been no signal of Torsade de Pointes in the extensive postmarketing experience with alfuzosin outside the United States. A separate postmarketing QT study evaluated the effect of the coadministration of 10 mg alfuzosin with a drug of similar QT effect size. 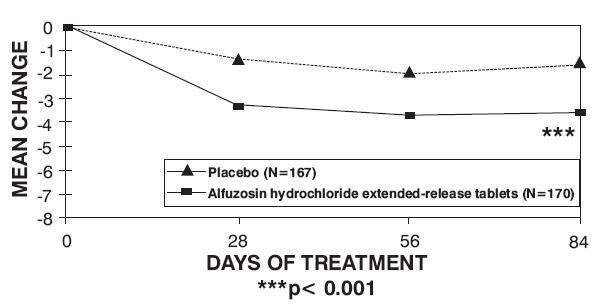 In this study, the mean placebo-subtracted QTcF increase of alfuzosin 10 mg alone was 1.9 msec (upperbound 95% CI, 5.5 msec). The concomitant administration of the two drugs showed an increased QT effect when compared with either drug alone. This QTcF increase [5.9 msec (UB 95% CI, 9.4 msec)] was not more than additive. 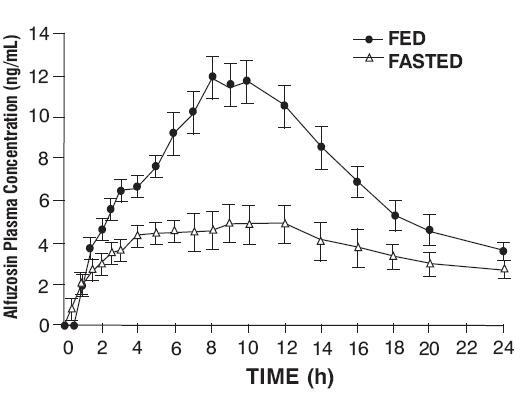 Although this study was not designed to make direct statistical comparisons between drugs, the QT increase with both drugs given together appeared to be lower than the QTcF increase seen with the positive control moxifloxacin 400 mg [10.2 msec (UB 95% CI, 13.8 msec)]. The clinical impact of these QTc changes is unknown. The absolute bioavailability of alfuzosin hydrochloride extended-release 10 mg tablets under fed conditions is 49%. Following multiple dosing of 10 mg alfuzosin hydrochloride extended-release tablets under fed conditions, the time to maximum concentration is 8 hours. Cmax and AUC0-24 are 13.6 (SD = 5.6) ng/mL and 194 (SD = 75) ng·h/mL, respectively. 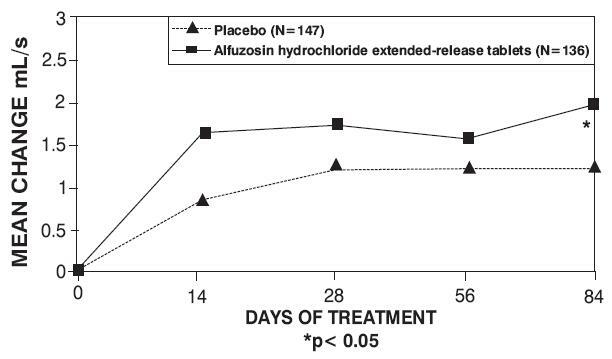 Alfuzosin hydrochloride extended-release tablets exhibits linear kinetics following single and multiple dosing up to 30 mg. Steady-state plasma levels are reached with the second dose of alfuzosin hydrochloride extended-release tablet administration. Steady-state alfuzosin plasma concentrations are 1.2- to 1.6-fold higher than those observed after a single administration. 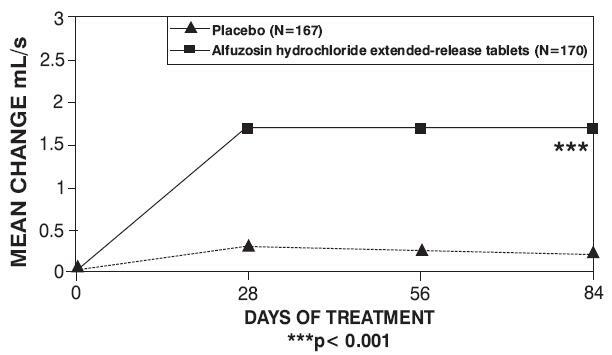 Following oral administration of 14C-labeled alfuzosin solution, the recovery of radioactivity after 7 days (expressed as a percentage of the administered dose) was 69% in feces and 24% in urine. Following oral administration of alfuzosin hydrochloride extended-release 10 mg tablets, the apparent elimination half-life is 10 hours. Renal Impairment: The Pharmacokinetic profiles of alfuzosin hydrochloride extended-release 10 mg tablets in subjects with normal renal function (CLCR>80 mL/min), mild impairment (CLCR 60 to 80 mL/min), moderate impairment (CLCR 30 to 59 mL/min), and severe impairment (CLCR <30 mL/min) were compared. These clearances were calculated by the Cockcroft-Gault formula. Relative to subjects with normal renal function, the mean Cmax and AUC values were increased by approximately 50% in patients with mild, moderate, or severe renal impairment [see Warnings and Precautions (5.2) and Use in Specific Populations (8.6)]. Pediatric Use: Alfuzosin hydrochloride extended-release tablets are not indicated for use in the pediatric population [see Indications and Usage (1.1) and Use in Specific Populations (8.4)]. Therefore, alfuzosin hydrochloride extended-release tablets are contraindicated for coadministration with potent inhibitors of CYP3A4 (e.g., ketoconazole, itraconazole, or ritonavir) because of increased alfuzosin exposure [see Contraindications (4), Warnings and Precautions (5.4) and Drug Interactions (7.1)]. Diltiazem: Repeated coadministration of 240 mg/day of diltiazem, a moderately-potent inhibitor of CYP3A4, with 7.5 mg/day (2.5 mg three times daily) alfuzosin (equivalent to the exposure with alfuzosin hydrochloride extended-release tablets) increased the Cmax and AUC0-24 of alfuzosin 1.5- and 1.3-fold, respectively. Alfuzosin increased the Cmax and AUC0-12 of diltiazem 1.4-fold. Although no changes in blood pressure were observed in this study, diltiazem is an antihypertensive medication and the combination of alfuzosin hydrochloride extended-release tablets and antihypertensive medications has the potential to cause hypotension in some patients [see Warnings and Precautions (5.1)]. Digoxin: Repeated coadministration of alfuzosin hydrochloride extended-release 10 mg tablets and digoxin 0.25 mg/day for 7 days did not influence the steady-state pharmacokinetics of either drug. Three randomized placebo-controlled, double-blind, parallel-arm, 12-week trials were conducted with the 10 mg daily dose of alfuzosin. In these three trials, 1,608 patients [mean age 64.2 years, range 49 to 92 years; Caucasian (96.1%), Black (1.6%), Asian (1.1%), Other (1.2%)] were randomized and 473 patients received alfuzosin hydrochloride extended-release 10 mg tablet daily. Table 4 provides the results of the three trials that evaluated the 10 mg dose. Alfuzosin hydrochloride extended-release tablets 10 mg are available as white to off white, round shaped, biconvex, uncoated tablet debossed with ‘956’ on one side and plain on other side. Keep alfuzosin hydrochloride extended-release tablets out of reach of children. See the section “What are the possible side effects of alfuzosin hydrochloride extended-release tablets?” for more information about side effects. What is alfuzosin hydrochloride extended-release tablet? Alfuzosin hydrochloride extended-release tablet is a prescription medicine that is called an “alpha-blocker”. Alfuzosin hydrochloride extended-release tablet is used in adult men to treat the symptoms of benign prostatic hyperplasia (BPH). Alfuzosin hydrochloride extended-release tablets may help to relax the muscles in the prostate and the bladder which may lessen the symptoms of BPH and improve urine flow. Some medicines called “alpha-blockers” are used to treat high blood pressure. Alfuzosin hydrochloride extended-release tablets are not for the treatment of high blood pressure. What you need to know while taking alfuzosin hydrochloride extended-release tablets? Take alfuzosin hydrochloride extended-release tablet exactly as your doctor prescribes it. Take alfuzosin hydrochloride extended-release tablet after the same meal each day. Do not take it on an empty stomach. If you take too many alfuzosin hydrochloride extended-release tablets call your local poison control center or emergency room right away. Store alfuzosin hydrochloride extended-release tablets at 20° to 25°C (68° to 77°F); excursions permitted between 15° and 30°C (59° and 86°F). Inactive Ingredients: pregelatinized starch, hypromellose, hydroxypropyl cellulose, basic butylated methacrylate copolymer, colloidal silicon dioxide, magnesium stearate, and talc.